This appendix presents the structure of the Global Competitiveness Index 2014–2015 (GCI). The numbering of the indicator matches the numbering of the data tables. The number preceding the period indicates to which pillar the indicator belongs (e.g., indicator 1.11 belongs to the 1st pillar and indicator 9.04 belongs to the 9th pillar). The computation of the GCI is based on successive aggregations of scores from the indicator level (i.e., the most disaggregated level) all the way up to the overall GCI score. Unless noted otherwise, we use an arithmetic mean to aggregate individual indicators within a category.a For the higher aggregation levels, we use the percentage shown next to each category. This percentage represents the category’s weight within its immediate parent category. Reported percentages are rounded to the nearest integer, but exact figures are used in the calculation of the GCI. For example, the score a country achieves in the 11th pillar accounts for 50 percent of this country’s score in the innovation and sophistication factors subindex, irrespective of the country’s stage of development. Similarly, the score achieved on the transport infrastructure subpillar accounts for 50 percent of the score of the infrastructure pillar. Unlike the case for the lower levels of aggregation, the weight put on each of the three subindexes (basic requirements, efficiency enhancers, and innovation and sophistication factors) is not fixed. 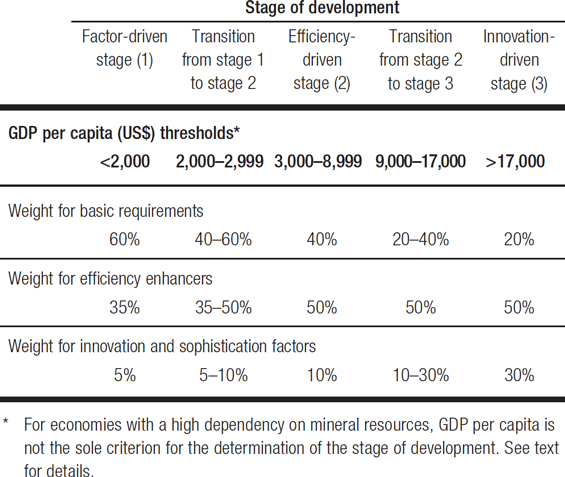 Instead, it depends on each country’s stage of development, as discussed in the chapter.b For instance, in the case of Burundi—a country in the first stage of development—the score in the basic requirements subindex accounts for 60 percent of its overall GCI score, while it represents just 20 percent of the overall GCI score of Sweden, a country in the third stage of development. For countries in transition between stages, the weighting applied to each subindex is reported in the corresponding profile at the end of this volume. For instance, in the case of Azerbaijan, currently in transition from stage 1 to stage 2, the weight on each subindex is 56.3 percent, 37.8 percent, and 5.9 percent, respectively, as reported in the country profile. (e)“N/Appl.” is used for economies where there is no regular train service or where the network covers only a negligible portion of the territory. Assessment of the existence of a network was conducted by the World Economic Forum based on various sources. (f) In order to capture the idea that both high inflation and deflation are detrimental, inflation enters the model in a U-shaped manner as follows: for values of inflation between 0.5 and 2.9 percent, a country receives the highest possible score of 7. Outside this range, scores decrease linearly as they move away from these values. (g) The impact of malaria, tuberculosis, and HIV/AIDS on competitiveness depends not only on their respective incidence rates but also on how costly they are for business. Therefore, in order to estimate the impact of each of the three diseases, we combine its incidence rate with the Survey question on its perceived cost to businesses. To combine these data we first take the ratio of each country’s disease incidence rate relative to the highest incidence rate in the whole sample. The inverse of this ratio is then multiplied by each country’s score on the related Survey question. This product is then normalized to a 1-to-7 scale. Note that countries with zero reported incidence receive a 7, regardless of their scores on the related Survey question. In the case of malaria, countries receive a 7 if the World Health Organization (WHO) has classified them as malaria-free countries or included them in the supplementary list of areas where malaria has never existed or has disappeared without specific measures. (h) The competition subpillar is the weighted average of two components: domestic competition and foreign competition. In both components, the included indicators provide an indication of the extent to which competition is distorted. The relative importance of these distortions depends on the relative size of domestic versus foreign competition. This interaction between the domestic market and the foreign market is captured by the way we determine the weights of the two components. Domestic competition is the sum of consumption (C), investment (I), government spending (G), and exports (X), while foreign competition is equal to imports (M). Thus we assign a weight of (C + I + G + X)/(C + I + G + X + M) to domestic competition and a weight of M/(C + I + G + X + M) to foreign competition. (i) Indicators 6.06 and 6.07 combine to form one single indicator. (j) For indicators 6.14, imports as a percentage of GDP, we first apply a log-transformation and then a min-max transformation. (k) The size of the domestic market is constructed by taking the natural log of the sum of the gross domestic product valued at purchased power parity (PPP) plus the total value (PPP estimates) of imports of goods and services, minus the total value (PPP estimates) of exports of goods and services. Data are then normalized on a 1-to-7 scale. PPP estimates of imports and exports are obtained by taking the product of exports as a percentage of GDP and GDP valued at PPP. The underlying data are reported in the data tables section (see Tables 10.03, 6.14, and 10.04). (l) The size of the foreign market is estimated as the natural log of the total value (PPP estimates) of exports of goods and services, normalized on a 1-to-7 scale. PPP estimates of exports are obtained by taking the product of exports as a percentage of GDP and GDP valued at PPP. The underlying data are reported in the data tables.